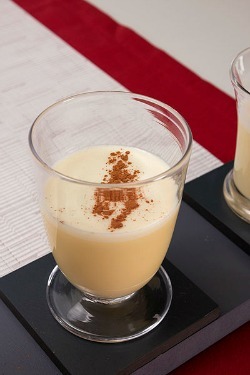 Homemade Egg Nog without the raw eggs. Who did not enjoy a glass or two of egg nog around the holidays? When the season was over, the egg nog went off the shelf too. What I found were recipes that called for raw eggs and cream. So I experimented with some vegan options and was able to whip up a nice egg nog recipe. -Place the ingredients into the blender and whip it up. Now you can enjoy this delightful drink anytime of year. You can even add a little rum to this drink to add the alcohol taste if you choose. It is just a sweet treat that I can whip up anytime and it gives me that holiday, ahhh, relax and chill out for a moment. Just a side note about raw eggs. I know it use to be done in the days when people had their own chicks, but it is not recommended these days with the high incidence of salmonella which is a bacteria found in uncooked eggs. Factory egg farms have found raw eggs to have this bacteria in a high number of the eggs tested, so it is not recommended to consume eggs raw. 1 Tbsp ground up flax seeds mixed with 3 Tbsp water for blended recipes for thickening. I never missed eggs once I learned these simple tips for raw foods and they work well for baking too. So keep this list on hand so you will have options for those recipes that call for eggs and go the alternative route with these suggestions.